Background Biomarker-based assessments of biological samples are widespread in clinical, pre-clinical, and epidemiological investigations. We previously developed serum metabolomic profiles assessed by HPLC-separations coupled with coulometric array detection that can accurately identify ad libitum fed and caloric-restricted rats. These profiles are being adapted for human epidemiology studies, given the importance of energy balance in human disease. Methods Human plasma samples were biochemically analyzed using HPLC separations coupled with coulometric electrode array detection. Results We identified these markers/metabolites in human plasma, and then used them to determine which human samples represent blinded duplicates with 100% accuracy (N = 30 of 30). At least 47 of 61 metabolites tested were sufficiently stable for use even after 48 hours of exposure to shipping conditions. 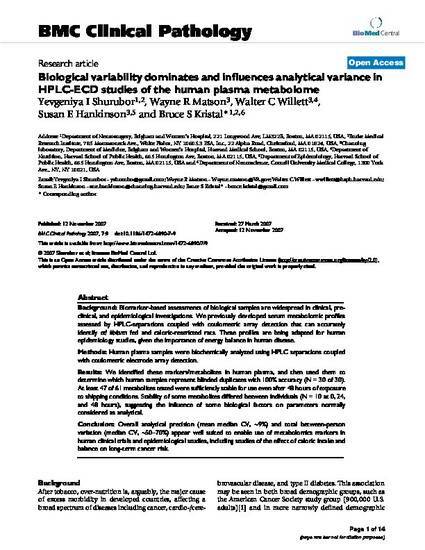 Stability of some metabolites differed between individuals (N = 10 at 0, 24, and 48 hours), suggesting the influence of some biological factors on parameters normally considered as analytical. Conclusion Overall analytical precision (mean median CV, ~9%) and total between-person variation (median CV, ~50–70%) appear well suited to enable use of metabolomics markers in human clinical trials and epidemiological studies, including studies of the effect of caloric intake and balance on long-term cancer risk. This article was harvested from BioMed Central.